Hello friends. 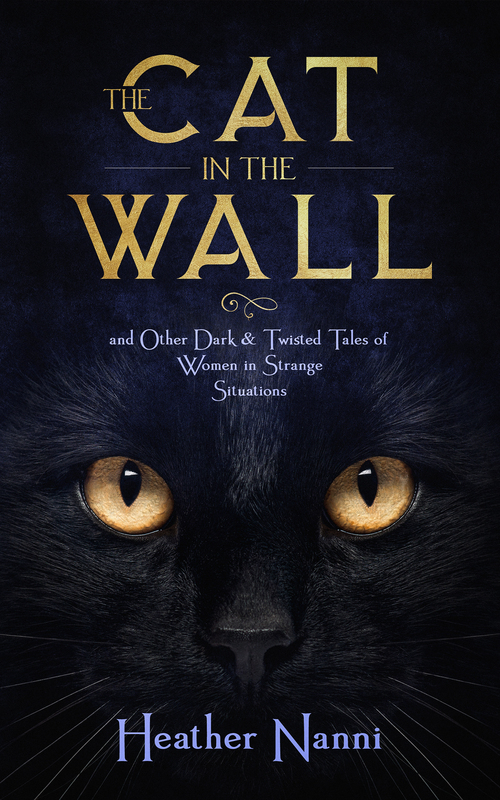 Over the past year I have been busy working on my book, “The Cat in the Wall and Other Dark & Twisted Tales of Women in Strange Situations,” which I recently published on Amazon. In this small collection of six short stories, I explore the spaces between sanity and madness & reality and fantasy. Each story includes a different female protagonist at a different life stage-from an eleven-year-old girl grappling with a sinister family secret, to a mother struggling with how to best cope with a child afflicted by a mysterious malady, to a woman whose grasp of reality becomes increasingly tenuous with age. All six characters must navigate a world where the line between what is real and what is fantastic is blurred. Now that my book is in the world, I hope to be more present here, this lovely place where I have learned so much about the craft of writing. If you would like to read “The Cat in the Wall,” you can go to Amazon here or click on the link on the right of this page. You can purchase it in either ebook and paperback format, and the first story is available to read for free. There is something incredibly exciting about holding your book for the first time! I wrote this four years ago, and, since that time, have often thought about the couple in the restaurant. I hope they are still well, but time when you are in your twilight years moves faster. Time in your middle years moves faster; I know because that is where I find myself today-thinking about that restaurant, that couple, my husband and children as we were when I first posted this, and that gray December sky; the same sky I tried to ignore at the restaurant; the same sky that I see now as I look out my window. Here is the original post (with a few minor edits). I was intrigued by the elderly couple who sat across from us at the restaurant. It was her, really, who called my attention. She had to be in her late seventies, perhaps early eighties. And she was beautiful in a hearty New England way. I would venture that she might not have been considered beautiful in her youth, but at that moment, as the beauty of others her age faded, she was vibrant. She was robust, not lithe; her face full and happy; her skin porcelain and glowing. Her eyes were blue, but what struck me most was that the lids did not sag with the heaviness of age. Those eyes sparkled large and childlike. She drank a cocktail and breezily chatted with the gentleman who sat across from her and whose back was to me. I gleaned that he, with his nearly bald head resting upon a neck buried deep beneath hunched shoulders, was older, mid-eighties maybe. It was a dreary, gray December day, and it seemed that the only place to be was a warm New England restaurant. All you had to do was ignore the view from the window and enjoy the soft lamplight of the indoors. As we shared a bowl of mussels, my husband, children and I chatted about our son’s birthday and Christmas and the wonderful things we planned to do over the winter recess. From time to time, however, I couldn’t help but study the elderly couple across from us. There was a gorgeous bouquet of peach and white roses on our neighbor’s table. Their anniversary I figured. “How wonderful,” I thought. How long must they have been married? Fifty years, give or take? And still, seeming so much in love. They chatted away, her voice somewhat high pitched and girlish. She reached across the table for her companion’s hand. She smiled and giggled and sipped her cocktail, and, at one point, she belly laughed. It was the kind of deep, uncontrollable, sincere laugh that, unfortunately, you seldom hear. She laughed so heartily that, try as she might, she couldn’t stop herself, and you didn’t want her to stop for the sound of her laugh was so cheerful. And just like that, the entire narrative I had created for our neighbors dissolved; yet, they were still so captivating, so charming, more so perhaps. Now there were so many questions. What had her life been like? Did she spend the first thirty years of her adulthood in a loveless marriage? Was she widowed while raising young children? Did she have any children? Maybe she didn’t have any. That might account for youthfulness. The elderly couple continued on, laughing and chatting. I heard her say, “Here we are. Having this lovely lunch in this beautiful restaurant, then we will go home and sit and it will be over.” She reached for her partner’s hand again and smiled and looked at her roses and grew silent just for a moment. But when the waitress came to check on the table, she resumed her happy chatter, commenting that the when she returns she would love it if the sangria had whole blueberries in it. She ordered dessert for herself and her partner-they would share a piece of chocolate cake. She might not have wanted the cake, but she didn’t want the moment to end. How she worked to hold onto that beautiful late afternoon lunch. I understood. I looked at my husband and our two children. He and I somewhat bewildered to find ourselves in our forties, still with the silly hopes and dreams we shared in our twenties, but different now, tired, worried. And our children. One who has so many struggles and the other who seems to navigate through life with ease but who already shoulders the weight of being the one for whom things seem to come easier. The four of us sharing a beautiful few hours. Just us. In that place. Wanting to stop time. To remain just as we were in that moment. As the sky outside the window grew darker, we realized our moment was over. Afternoon was gone, having slipped away under a cloak of charcoal sky. Our neighbors stood up to leave. She, tall and straight and carrying her vase of flowers, led the way to the exit. He, fragile and stooped, followed slowly behind. I prayed they would return again for another anniversary. This lake, she is so pretty. springing forth from a time when all was ice. But, with this dear lake, there is nothing to fear. until I found my way to her heart. to the old amusement park. the charming elderly lady who lives in that cottage with her jaunty puppy. with lakes quite similar to this one. It was between navy and silver violet. She had to decide which before she could proceed. Anne had no aptitude for design, but Christopher left it up to her. The only thing he requested was that she not replicate her mother’s home. Anne wished her mother, Lucy, were there to help. She had an eye for decorating. Anne remembered when her parents moved to the house on Highland Street, how her mother chose fabrics and patterns with such confidence. Lucy liked traditional design. Anne knew she would disapprove of the silver violet. It would be so different from the hunter green and mahogany colors her mother selected for her own family room. Different was what Christopher wanted though, and Anne wanted to please him. But, did Anne like silver violet? She didn’t know. Sometimes Anne didn’t know her own mind. Damn it. Anne always needed help making decisions. Growing up her mother was forever telling her to change her clothes, change her friends. She was usually right, although Anne still didn’t understand why her mother would sometimes slap her for her missteps. Anne could never hit Lily. For Christ’s sake, she was forty-three years old. Why was it so difficult to make a decision for herself? Her seven-year-old daughter could say what color she preferred. Lily would prefer silver violet. She would be upset if Anne chose the navy.